I love the zoo. I always have. What an amazing experience to be able to see animals from six continents in one city park. A zoo is one of the locations where the world shrinks for a moment allowing us to appreciate the diversity and creativity of our God. My wife, son, and I recently took advantage of a day off to head to the Oklahoma City Zoo for a day of admiring Yogi, Boo Boo, Simba, Pumba, and all their friends. This was not our first trip to the Oklahoma City Zoo, therefore we did not have a long agenda of what we wanted to see. At the top of our list was a desire to see the Great EscAPE, the zoo’s large area devoted to primates. We spent a good deal of time at the gorilla exhibit. While we watched the big apes forage around for sweet potatoes and cabbage, I read a very interesting sign that talked about hostile encounters with gorillas in the wild. While King Kong may be a ferocious aggressor, the poster I read spoke of much of the meaning behind an “attack” by a gorilla in the wild. It seems that if a gorilla feels threatened it will go through many theatrics to try to get your attention and convince you to head the other way. The gorilla’s impressive display begins with a bluff charge and continues with showing teeth, chest pounding, and loud noises. All these actions are designed to do one thing: convince you that you don’t want to tangle with this ape. In other words, the gorilla does not want to fight, so it will give you every chance to back down. I thought of this example today as I pondered the graphic details of Revelation 6-9 and its description of God’s intense judgment of the earth in the end times. Chapter 6 shows God’s judgments unfolding as seven “seals” are opened expressing judgment and atrocities on the earth. Chapters 8-9 continue with seven “trumpets” full of judgment being unloaded on the earth. This impressive display begins with a charge into wars and continues with disease, earthquakes, darkness and worse. What is interesting to me, though, is to ponder the reason for judgment unfolding as slowly as it does. In other words, why does God judge the earth in so many different ways and taking as much time as He does? One possibility is that He wants to inflict the most punishment possible. However, I do not think that is the reason for the protracted period of judgment. I think God draws out judgment not to hurt but to provide one last chance to help. By giving humanity seven years of judgment God is showing His grace again by giving people one last chance to repent. My view on this is supported by the one chapter nestled within this section that does not include any judgment . . . Revelation 7. This chapter begins with God pausing judgment by saying in 7:3, “Do not harm the land or the sea or the trees until we put a seal on the foreheads of the servants of our God.” The passage goes on to let us know that those who will be saved during this time of judgment will come from people from every tribe and nation on earth, including Israel . . . God’s original chosen people who once rejected Jesus Christ, but will come back to accept Him the last days. 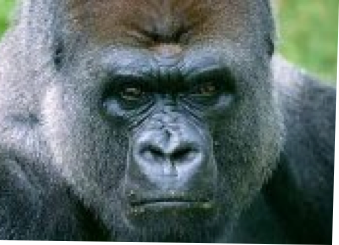 The gorilla’s charge is designed not to dismember you but to turn you away. God’s progressive judgment of the earth is designed not merely to damn but to turn us back toward Him. God does not want to destroy mankind, so He will give us every chance to back down from our selfish ways and accept His amazing grace. Remember that the next time you read Revelation or the next time you wonder about the heart of God amidst passages of judgment. God is a holy God and must judge sin, but God is also a loving God and offers a way out for people. Praise Him.